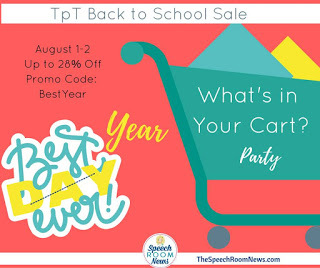 Guess what, it’s already time for TPT’s back to school sale! Woo Hoo! Who doesn’t love a good SALE?! But wait…where did the summer go? No need to worry. There will be TONS of great products offered at DEEP DISCOUNTS August 1st and 2nd using the promo code “BestYear”. Check out a few of my favorite products and some that I already have in my cart. 1. 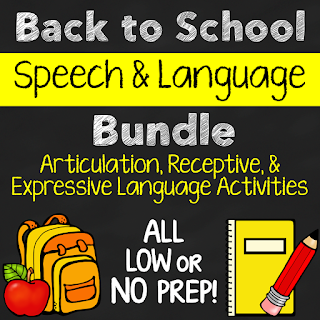 Back to School Speech and Language Bundle – This bundle has a lot of great Low/No Prep options for Articulation, Following Directions, Compare/Contrast, and Categorization. Each activity is school themed and great for a variety of ages and diagnoses. 2. 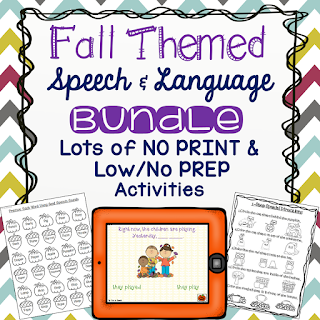 Fall Themed Speech and Language Bundle – This bundle is PACKED with favorites. 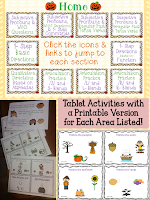 One of the most unique features of this bundle is the No Prep Interactive Fall Themed Activities. 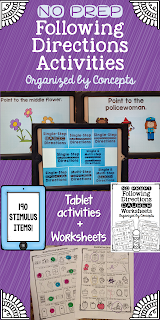 These Tablet/Smart Board/Computer activities target concepts such as Articulation, Following Directions, Grammar, and WH- questions. In addition to these No Prep activities, there are worksheets, printable activities, articulation board games, and PLENTY of activities to get you through the entire fall season. 3. 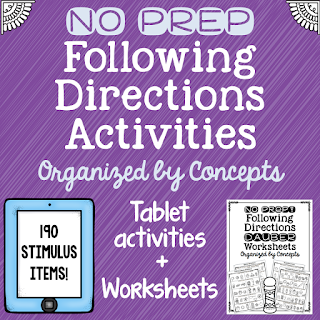 NO PREP Following Directions Interactive Tablet Activity + Printable Worksheets – This activity pack is FULL of Following Direction Activities in a Variety of Formats! One of the most unique features of this activity pack is the fact that there is auditory biofeedback tied into the interactive activity. The PowerPoint version includes SOUND EFFECTS so the student is provided with a consistent sound if the answer is incorrect (and the slide WILL NOT advance) and then a different sound effect (and slide advancement) if the student selects the correct response! This is SO HELPFUL and keeps students engaged. There is also a PDF version WITHOUT sound effects included for those student who are easily distracted. 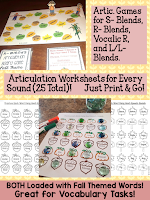 There are 2 different versions of 10 worksheets to complement the interactive activity. Each section is organized by concept and very convenient for progress monitoring and collecting baselines! 4. 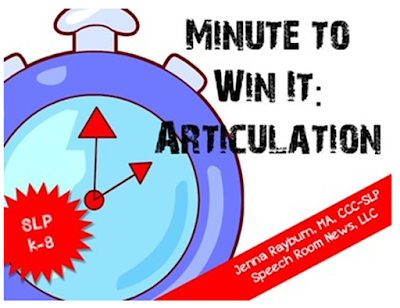 Minute to Win it: Articulation – I am super excited about these Minute to Win it Articulation Activities! The thing that really appealed to me is that the only materials that you need are common household items like straws, plastic cups, and paper plates. There are 11 different challenges and I think they will be GREAT for groups or last minute therapy ideas! Check this product out from Jenna Rayburn! 5. 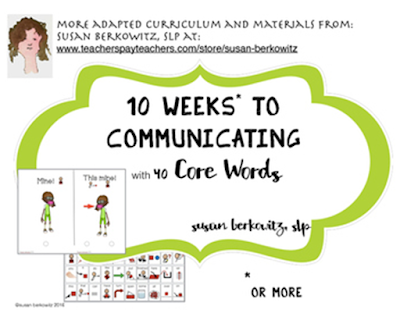 Ten Weeks Communicating with 40 Core Words – This is EXACTLY what I need! This will help keep me organized and help me figure out what words I should target. The visuals look great and there are plenty of words to get you started off on the right foot this school year. I’m looking forward to using these. Check out the full product from Susan Berkowitz! 6. 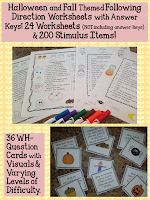 Grab n’ Go WH- Questions – These will be super helpful and great to grab in a pinch. 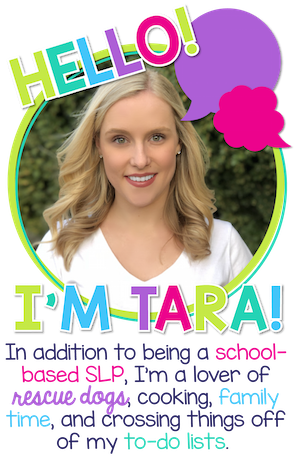 I already have a few other Grab n’ Go products from Kristine Lamb at Live Love Speech, so I KNOW how convenient these products can be! This pack looks really thorough and I love a good hands-on activity. I’m excited to bust these out this year! 7. 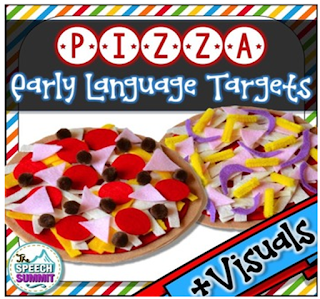 Pizza Early Language Targets – Did you read the first word in that title, “Pizza”! Do I even need to say more? 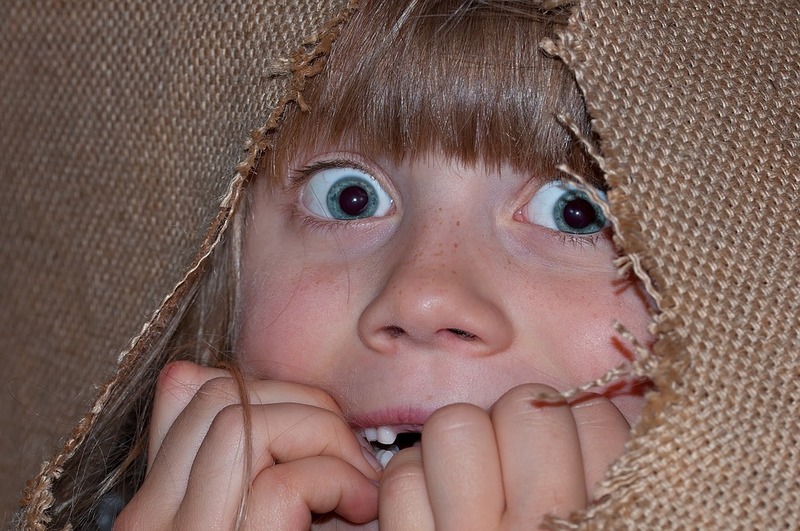 I really value activities that require a little prep work, but result in highly motivating and hands-on activities. This product looks GREAT and I think that I will be able to use it in multiple ways with lots of mixed groups! My students (and I) are really going to enjoy these activities! Check them out from The Speech Summit. Alright everyone. Thanks for stopping by and checking out these wonderful resources. 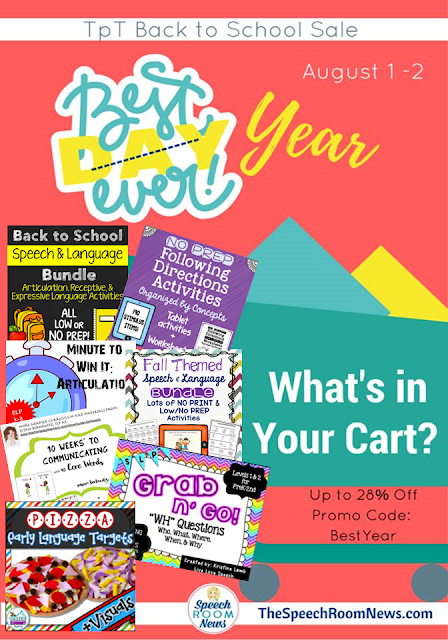 Now go fill your cart and don’t forget to use the promo code “BestYear” on Aug. 1st and 2nd! 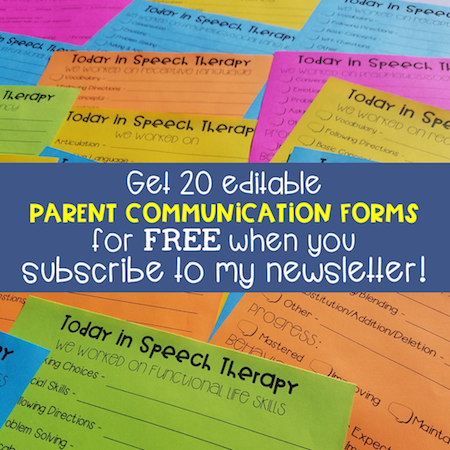 Check out Jenna Rayburn’s original Linky post at her Speech Room News blog for even MORE great resources! Great post. Your products look very creative.